My weekends often involve making pancakes with my boys. Both Big A and Little A love to help me make the batter. Big A has a bit of a syrup addiction. Little A likes peanut butter. Afterwards there is rather a lot of mess to clean up, but it is always fun. Last Saturday we didn’t make pancakes for breakfast. But I did make them that day. It was a busy day, with Big A’s twilight fete in the afternoon and filming a cooking show in the morning. Blogger Eileen from The Food Avenue and I featured in filming for A Taste of Canberra. We cooked three items that recreated food that has become well known in the Canberra food scene. Yes, Canberra has a food scene and this was in evidence at Eat Drink Blog 15 and the faint surprise by visiting food bloggers from interstate. 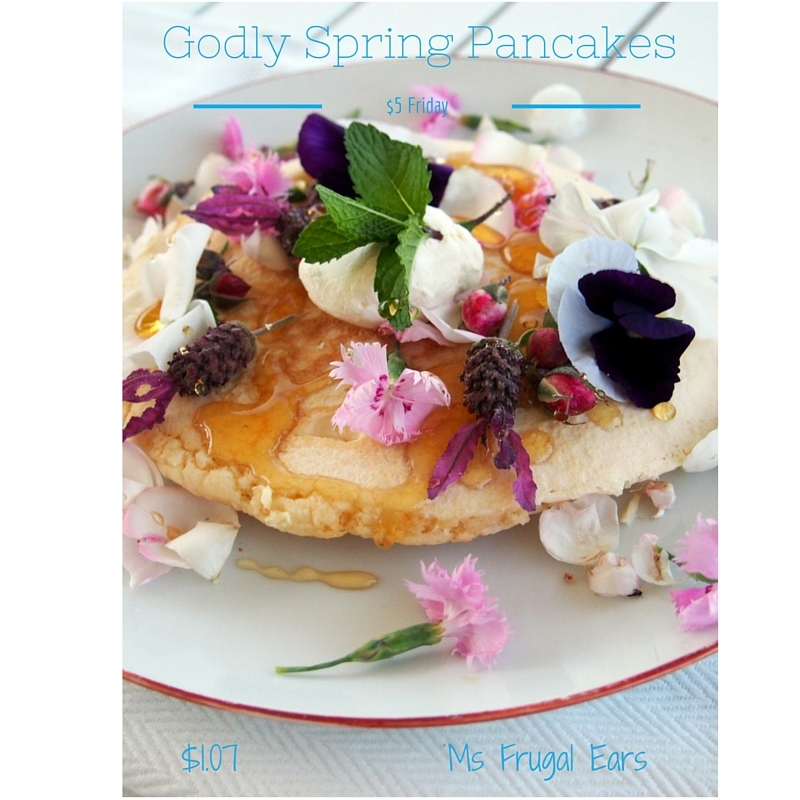 One of the dishes we cooked during filming was pancakes reminiscent of the spring menu pancakes at The Gods Cafe and Bar at the Australian National University. 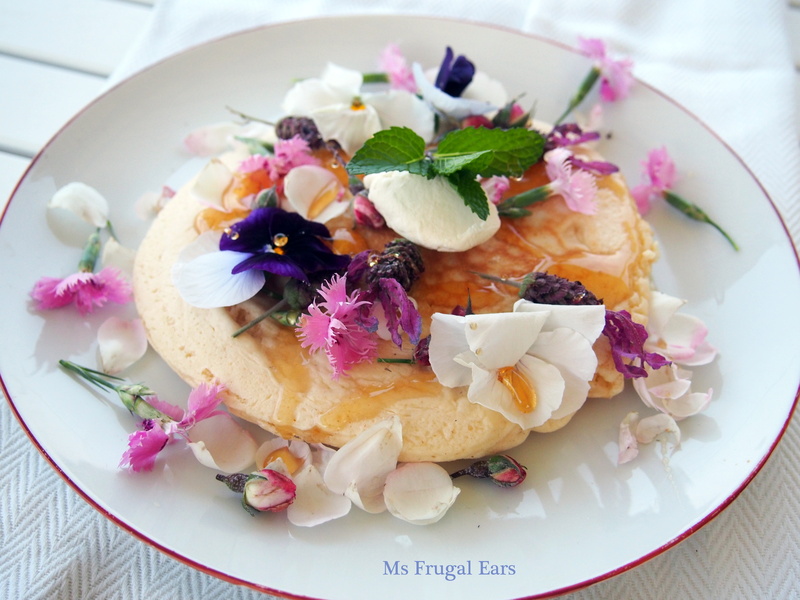 These pancakes are famous because they are special and so beautiful. They are not any ordinary pancakes: they are a work of art. I have recreated this recipe with my own frugal touch, based on my secret waste-not-want-not recipe I have been using for years. The magic ingredient is whey. Way, is that whey? Yes. In this case, it is the whey byproduct from homemade yoghurt. And this week I had way too much whey after making yoghurt cheese for last week’s salted caramel fete cake. Whey is one of those things that is often discarded in the kitchen. But I never throw it out, as it is incredibly nutritious: it is high in calcium, low in calories and contains high quality amino-acid rich protein. Used in the batter, it works in a similar way to buttermilk producing incredibly light and fluffy pancakes. Try it and you will see. If you don’t have any whey you can substitute milk or buttermilk (make homemade buttermilk by adding a teaspoon of lemon juice to a glass of milk and allowing it to rest for around ten minutes). 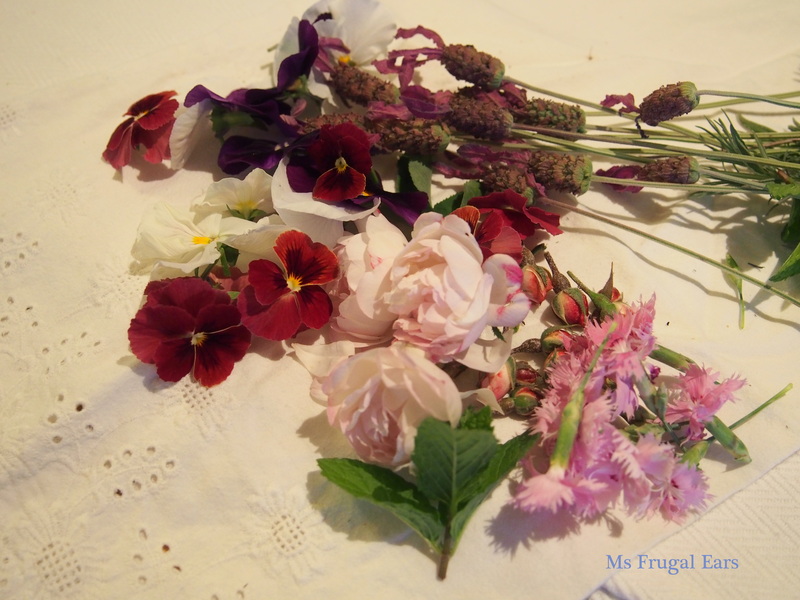 I also raided my garden for decorations for the pancakes. I really love purple/lilac colours. Can you tell? Place the flour and sugar (if using) in a bowl. 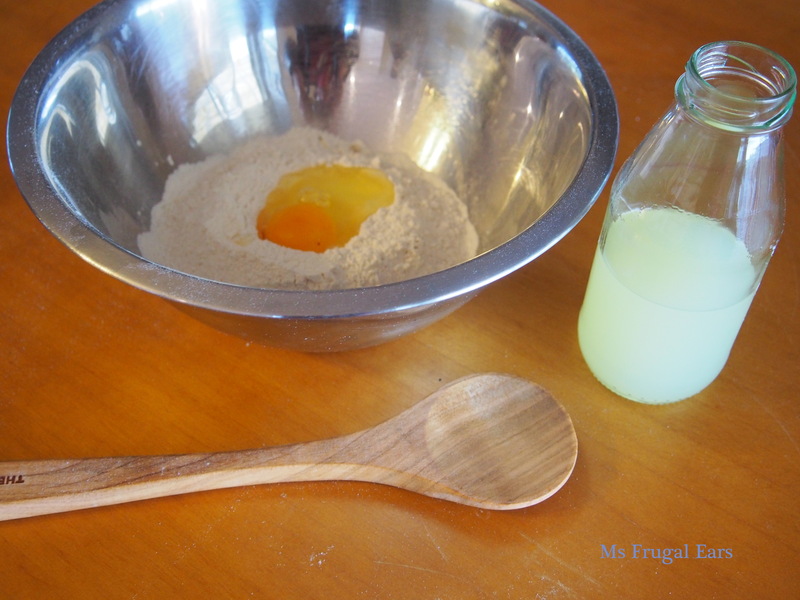 Make a slight indent in the surface of the flour, then break in the egg. Stir with a wooden spoon to combine, then gently stir in the whey. 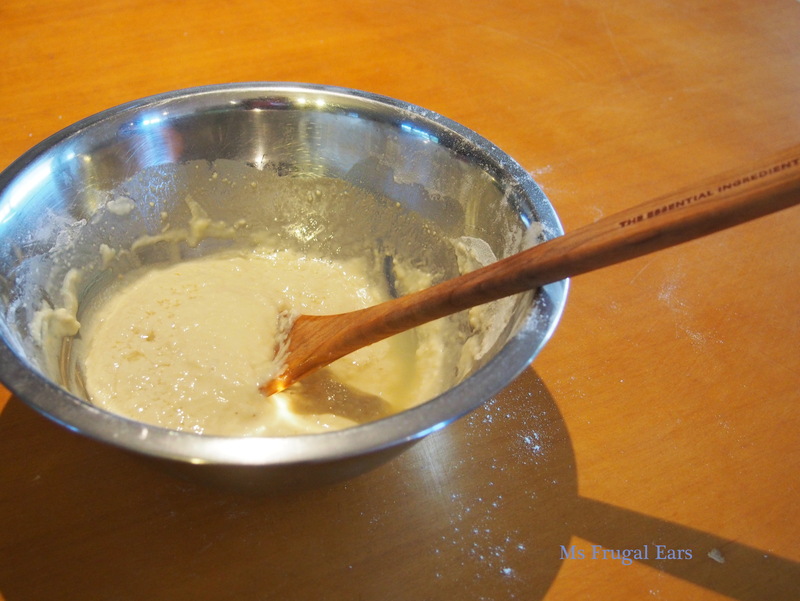 It is not essential to have a smooth batter; if it looks like porridge it is probably too lumpy so stir it out a bit. Allow the batter to sit for around 30 minutes. Heat butter in a heavy-based frypan (I love my cast iron one). When sufficiently hot (don’t rush this process), pour in ladle of batter. When it bubbles on top and firms, flip it over and cook on the other side. Remove to a warm plate. 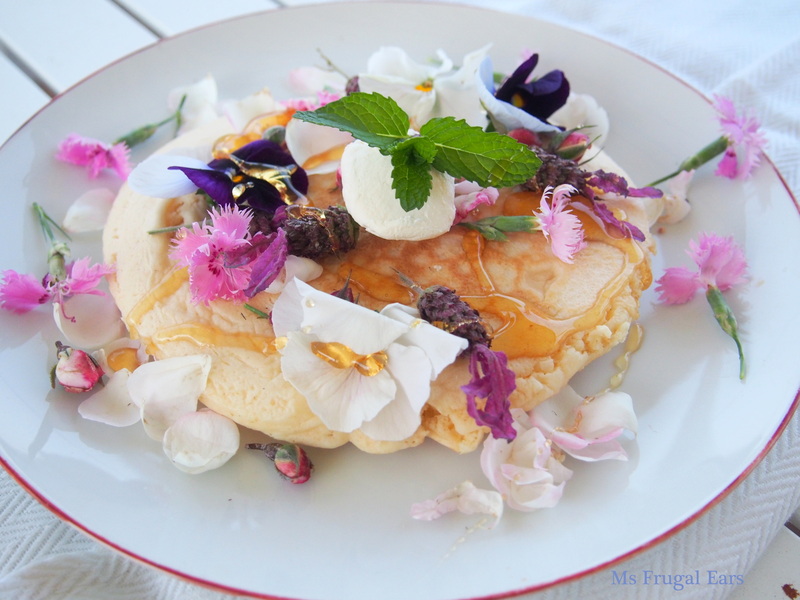 Top with fresh flowers and a quenelle of thick yoghurt (I used leftover yoghurt cheese). Drizzle with raw honey and serve. I don’t see why not:) It won’t rise as much without baking powder (although you could add it separately) and it won’t be as light. But still delicious. Using wholegrain flours, or adding in healthy bits into pancake, is a good way to get my kids to eat more fibre without them realising it. They cotton on when I use 100% wholemeal flour, but if only say 50/50 I can sneak it in.